Resource Central employees Max Hartmann (left) and Neka Sunlin haul the MacFarland family's vintage toilet out of their Longmont, Colorado home. Throughout the western U.S., water conservation is in the toilet. Since the 1990s, a strange phenomenon has played out in arid western urban areas. Populations are booming while overall water use is staying the same or going down. The trend is clear in Denver, Albuquerque, N.M., Las Vegas, San Diego and Phoenix: Cities are growing and using less water in the process. It's impossible to give credit to one single solution, but one could make a strong case that the MVP award for water conservation efforts should go to the modern toilet. The toilet is the single largest user of water in the home. It uses more than the washing machine, the dishwasher, the shower or the kitchen faucet. About a quarter of all water that enters a home will flow through the toilet according to a 2016 study. Each day the average toilet will use about 33 gallons of water. That might sound like a lot, but it's a big improvement. In 1999 the average toilet guzzled more than 45 gallons of water daily. The story of how the toilet became the unsung hero of water conservation includes an act of Congress, some elbow grease and logs of miso paste. Theresa MacFarland lives in a historic two-story house in Longmont, Colo., with her husband and two kids. Built in 1928, their home has all the vintage touches: hardwood floors, big windows, wood detailing and one really old toilet. A little stamp on the bowl says it was built in the 1950s. MacFarland points it out to her 4-year-old daughter Althea. "That toilet has been there longer than daddy and I have been alive," she says. "Probably longer than grandma and grandpa have been alive." As aging toilets are wont to do, it started acting up. So MacFarland contacted Resource Central, a Boulder-based conservation group and asked for help installing a new, more water-friendly model. Neka Sunlin showed up with the latest in toilet technology. Sunlin oversees the group's toilet replacement program, Flush for the Future. "We guesstimate this one is using about five gallons a flush," she says about the old toilet. "The new one uses less than one." In Sunlin's years with Resource Central, this is the oldest toilet she's condemned to the local recycling center. By swapping it out, the McFarland family could see a dip in their water bill, she says. A fast-growing alternative to high-priced Boulder, the city of Longmont has an interest in what happens in the MacFarland family bathroom. Water saved from their home is water that can be put to use somewhere else. That's why the city, along with a handful of other water providers on Colorado's Front Range, subsidizes the cost of high-efficiency toilets. MacFarland is paying $175 for the new toilet, the cost of installation and removal of the old one. Her new model retails for $160. Sunlin says it's an easy switch with a big pay off. With other conservation programs you first have to convince people to use less water. "But a toilet is a toilet," she says, "and it's no behavior change whatsoever. You literally just save water with every flush." In the last three years Resource Central has upgraded 2,000 toilets, which calculates out to 500 million gallons of water saved when looking at the average lifespan of the toilet of 30 years. "Most people don't realize that if their toilet is more than 10 or 15 years old, replacing their toilet or upgrading their toilet is one of the most impactful ways they can save water," says Neal Lurie, president of Resource Central. The group receives funding from the Walton Family Foundation, which also provides support for public radio member station KUNC's water reporting. "It can save between 200 and 300,000 gallons of water over the life of that toilet," he says. The road to high-efficiency toilets began back in 1992. The concern was less about water scarcity in the West and more about overwhelmed sewage systems on the East Coast. Congress was feeling pressure to pass national standards for water use and came up with the Energy Policy Act, a law that spawned a generation of low-flow fixtures. For the plumbing industry, it was a huge deal. "Absolutely, it was an extremely watershed moment, no pun intended," says Pete DeMarco with the International Association of Plumbing and Mechanical Officials. The law mandated that toilets flush using 1.6 gallons of water or less. Throughout the 1990s, low-flush toilets flooded the market. But the results were not always satisfactory. DeMarco says users hated the new models. They complained that their "new and improved" toilets performed worse than the old ones, unable to finish the job in a single flush. "There were some poor-performing products back in the mid-90s. I think the regulation caught some manufacturers off guard," he says. In many cases, DeMarco says, manufacturers had simply reduced the amount of water a toilet used without making significant changes to the inner workings. A lower flow just couldn't cut it. Frustrated customers sent toilet-makers back to the drawing board and manufacturers came up with a test to demonstrate flushing effectiveness for new toilets. The test came from a company called Maximum Performance. Using logs of miso paste in the toilets, the test allowed manufacturers to demonstrate that their new low-flow toilets could actually evacuate the bowl with one flush. DeMarco says toilets can't take all the credit, but this one innovation is a big reason why cities have been able to grow and still keep their water use in check. Indoor use dropped 22 percent nationwide between 1999 and 2016, much of that due to swapping out old fixtures. In recent years some states with water scarcity problems — like Colorado and California — have passed even tighter regulations on how much water toilets can use. "So you basically have these high-efficiency toilets now as a matter of course. You cannot go out in a store in Colorado, in California, and buy an old toilet," says Drew Beckwith, a water policy expert who works in suburban Denver. Beckwith says conservationists have been a victim of their own success. With national standards in place and active replacement programs throughout the country, there's not much more they can do to limit water use inside homes. All new residential developments are putting in high-efficiency toilets because there's no other option on the market. And when old models need replacing in existing homes, the only available option is a high-efficiency toilet. "We've sort of done our business with respect to toilets," Beckwith says. "And it's time to, you know, maybe get off the pot and move on to outdoor water use which is more the focus of urban water efficiency today." Back at the MacFarland home, the toilet transition is complete. 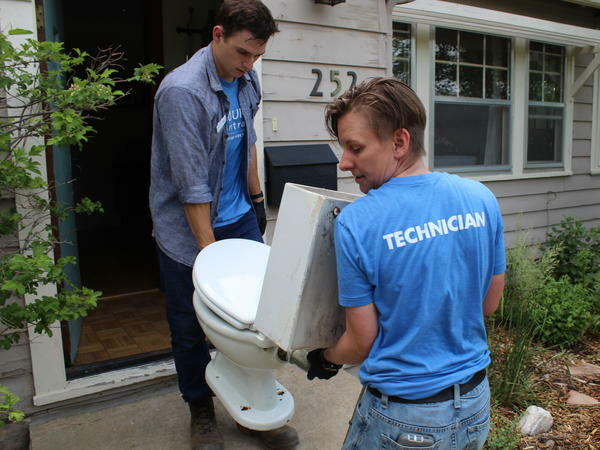 The nearly 70-year-old toilet is loaded on a van bound for the recycling plant. The brand new high-efficiency toilet is hooked up and the water is flowing. "This is going to be a huge improvement," Theresa MacFarland says. "And it feels like with very little effort, which I'm very excited about." Even though some conservationists say much of the indoor water use fruit has been plucked, a 2017 Alliance for Water Efficiency study found that more than 13 million non-efficient toilets — those that flush more than 1.6 gallons — remain in five states, including those with the toughest restrictions: California and Colorado. A nationwide push to rid the country of old toilets could have a significant effect. If all toilets were high-efficiency, indoor water use could drop an additional 35 percent to below 40 gallons per person per day, the study projected. MacFarland says she loves the character and charm of her historic home, and she's focused on making it environmentally-friendly. But it takes time, energy and money to make it happen. "We've been slowly trying to figure out ways to have just less water usage in this home," she says. "Knowing in Colorado it's such a precious resource, and we want our kids to grow up here and also recognize what comes with living in Colorado and trying to do our part." The Resource Central technicians ask for a practice flush to make sure it's working right before they depart. The honor of the first flush goes to McFarland's daughter Althea. "Check it out. There's this new button," MacFarland says as she motions to her daughter. "Kind of the same as the other one, except inside the tank this is so different than the other one. This one just uses a little bit of water." "And it's cleaner," Althea says. "And it's cleaner, way cleaner," MacFarland says. This story is part of a collaborative series from the Colorado River Reporting Project at KUNC and Elemental: Covering Sustainability, a new multimedia collaboration between public radio and TV stations in the west. Something unexpected is happening in the West's biggest cities. Population is booming, but water use is staying the same or in some cases, actually going down. From member station KUNC, Luke Runyon reports on what to credit for all that savings. LUKE RUNYON, BYLINE: Theresa MacFarland, her husband and two kids live in an historic two-story home in Longmont, Colo., just outside Boulder. It has all the vintage touches - hardwood floors, big windows, wood detailing, and one really old toilet. MacFarland points it out to her four-year-old daughter Althea. THERESA MACFARLAND: That toilet has been there longer than Daddy and I have been alive. MACFARLAND: Probably longer than Grandma and Grandpa have been alive. RUNYON: A little stamp on the bowl says it was built in the 1950s. Lately, it's had some trouble getting the job done. And that's why MacFarland contacted a local conservation group called Resource Central to find a more water-friendly model. Neka Sunlin oversees the group's Flush for the Future program and helped install McFarland's new toilet. SUNLIN: We guesstimate this one's using about five gallons a flush. The new one uses less than one. SUNLIN: It's 0.8 gallons per flush. So you're going to be saving probably four gallons of water per flush. RUNYON: In an average month, a toilet uses more water than any other fixture in a home - more than your washing machine, your occasional long shower and way more than your dishwasher. People flush between five and eight times a day. Since the 1990s, people have been replacing a lot of toilets throughout the country. Back then, Congress created national standards for water use. They mandated toilets use only about one and a half gallons for each flush. For the plumbing industry, it was a huge deal. PETE DEMARCO: Watershed moment - no pun intended. RUNYON: One of the people who helped write the low-flush rules was Pete DeMarco. He's with the International Association of Plumbing and Mechanical Officials. DEMARCO: And it wasn't just toilets where flows were being reduced, but showerheads, kitchen faucets, lavatory faucets and urinals were also being regulated. RUNYON: DeMarco says this is a big reason why cities have been able to grow and still keep their water use in check. Indoor use dropped 22 percent nationwide between 1999 and 2016 - much of that due to just swapping out old fixtures. And recently, states with water scarcity problems have passed even tighter regulations. DREW BECKWITH: And so you, basically, have these high-efficiency toilets now, as a matter of course. You cannot go out in the store in Colorado or California and buy an old toilet. RUNYON: Drew Beckwith is a water policy expert who works in suburban Denver. He says conservationists have been a victim of their own success. With national standards in place, there's not much more people can do to limit water use inside homes. BECKWITH: We've sort of done our business with respect to toilets. And it's time to, you know, maybe get off the pot and move on to outdoor water use, which is more - I see - the focus of urban water efficiency today. RUNYON: Back at the MacFarland home outside Boulder, the brand new toilet is hooked up. RUNYON: And water is filling the tank. The honor of first flush goes to Theresa MacFarland's daughter Althea. MACFARLAND: Check it out - there's this blue button. (Unintelligible). Give it a shot. RUNYON: Didn't think we'd get through this whole story without hearing at least one flush, right? For NPR News, I'm Luke Runyon in Longmont, Colo. Transcript provided by NPR, Copyright NPR.